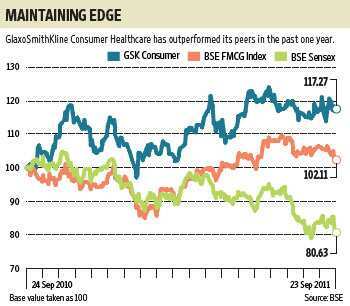 GlaxoSmithKline Consumer Healthcare Ltd has outperformed peers in the consumer sector. In the past one year, the FMCG index on BSE has outperformed the broad market, rising by 2%, compared with a 19% fall in the Sensex. The maker of Horlicks and Boost malt-based drinks, which has also added biscuits, nutrition bars and noodles to its portfolio, has been successful in driving volume growth. In the June quarter, its volume growth was 15.5%, while price increases were 5.9%. The distribution of growth is reassuring for investors in inflationary times. When consumers are feeling the pinch, they are more likely to reach out to brands whose prices have not increased by much. The strategy is sensible; but in a rising cost scenario it can affect margins, too. In GSK Consumer’s case, operating profit margin has fallen by about 122 basis points (bps) year-on-year in the June quarter, and by around 470 bps on a sequential basis. One basis point equals one-hundredth of a percentage point. The company’s main inputs are milk and milk powder, which together account for around 40% of raw material costs; malt contributes about 24%, and there are others such as sugar and wheat flour. Now sugar and wheat flour prices have fallen off their highs seen in 2010. Milk prices continue to trudge up, but slower compared with 2010, and have risen by around 7% in the calendar year so far, compared with about 12% last year. The price of barley—used to make malt—had turned volatile in the recent quarters, affecting the company’s costs. It had risen by around 40% between March and May; in the September quarter, prices have fallen. A return to normal price levels will get reflected in its input costs in the forthcoming quarters. GSK Consumer’s performance hinges on a more diversified geographic growth spread, as nearly 90% of domestic sales are from southern and eastern markets. The company’s efforts to change this ratio are working, and in the June quarter, sales in the northern market rose by 31% and in the west by 16%. Another key factor is increasing the share of non-malt food drink sales: it has risen to 6.2% of the total sales in the June quarter, compared with 5.1% in the year ago period. There is a long way to go before this becomes a significant component of sales. The company’s sales growth strategy appears sustainable. The significant risk on the horizon continues to be inflation, and its impact on input costs, and consumer demand as well. GSK Consumer’s rich valuations, trading at a price-earnings multiple of 28 times its estimated 2011 earnings per share, seem justified given its growth rates. Unless margins drop sharply from current levels, or growth slides unexpectedly, it should continue to outperform rivals.